This year Youngbrook Recruitment are celebrating our 11th anniversary and have been reflecting on our business success as an industry leader in the Australian recruitment industry across labour hire, temporary staffing solutions and permanent recruitment. Although a focus on the number of sales and ROI will prevent you from sinking in the market, when employees are pushed to focus more heavily on sales over quality service delivery it can affect customer satisfaction and ultimately business success. As a result, we go above and beyond for candidates and clients, with the aim to communicate well and return all phone calls by the end of the day. We genuinely care about our clients and candidates, working to benefit all parties. The quality of your employees’ customer service delivery can be measured through KPIs, such as customers’ overall satisfaction, customer retention, employee productivity, customer conversion rate, number of complaints and the complaint escalation rate. The satisfaction of your employees is important for not just employee retention but customer satisfaction. The cycle of success and the cycle of failure coined by Schlesinger and Heskett in 1991, reveals that employee satisfaction produces a positive service attitude. As a result, your business will receive higher customer satisfaction, higher customer retention rates, customer loyalty and repeat purchases. 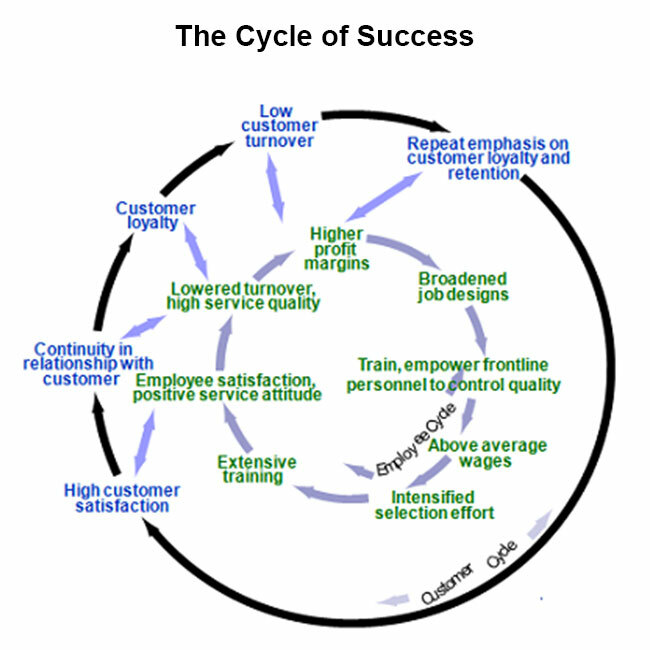 The key requirements identified in the cycle of success you need to apply to produce employee job satisfaction are a broad job design, above average wages, extensive training, and the feeling of employee empowerment to control quality and customer complaints. 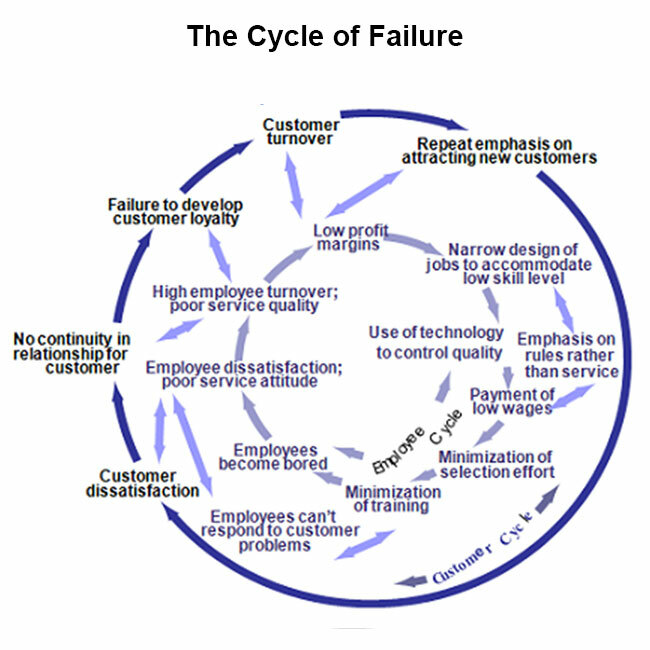 Does your business follow the cycle of success or the cycle of failure or are you somewhere in between? The value of a well-known brand name is in its effect on brand awareness, brand loyalty and brand associations. Your business’ brand equity is created through a product or service that is superior in quality, recognisable and has a memorable brand image. In a study cited by Forbes, 64% of marketers believe word of mouth is the most effective form of marketing. Therefore, utilising word of mouth marketing through earned media and reviews can build a solid reputation for your business. Just because a company is a market leader, does not mean it will maintain its position. 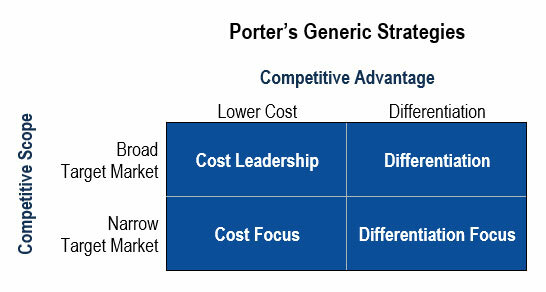 Michael Porter identified four generic strategies to maintain a sustainable competitive advantage to differentiate your business from competitors. A cost leadership advantage is when a business provides value at a lower price by improving operational efficiency. A differentiation strategy is when a company delivers benefits better than competitors, such as a unique or high-quality product, faster delivery, innovation, or higher customer service. A focus strategy is when a company services their target market better than competitors. A cost focus emphasises cost minimisation in a narrow target market. Whereas, a differentiation focus is when a company pursues strategic differentiation in a narrow market. To continually grow as an industry leader, we monitor advances in technology and methodologies to make tasks efficient. As a result, we have paired our quality service with an ISO 9001 Quality Management System. 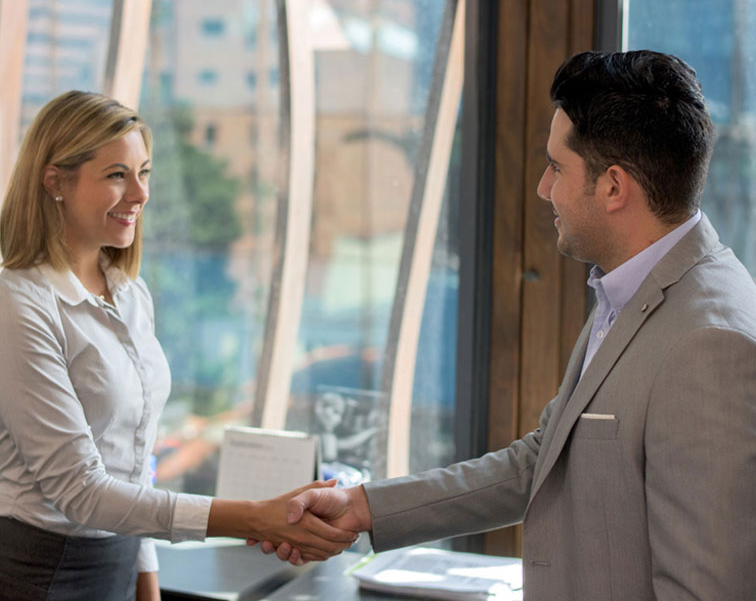 So, our recruitment methodology has a strong customer focus, continual improvement, relationship management, a process approach to achieve consistency, and a leadership direction and mission. One key resource is hiring the right people for the position and company culture. Youngbrook Recruitment focuses on selecting talent who have skills and experience in areas that existing employees do not. Consequently, this enables the business and existing employees to be challenged and grow. To ensure you are a leader in your industry, regular competitor and market analysis will help you keep ahead of industry changes. We stay ahead of market changes by monitoring competitors’ strategies, website content, social media presence, and job advertisements. Regular competitor analysis and reports will empower you to differentiate yourself from competitors, understand the talent competitors are employing, and catch new industry developments. It is important for your management edge to not be sharp, as you do not want to blow the roof of the office like a volcano. So, do not sweat the small stuff. Following the Australian Government’s Business plan template and guide, you can gain an understanding of the market and plan the business’ goals and objectives, finances, as well as plan for the future. Therefore, you can set your business’ priorities and track your progress. Furthermore, it will ensure you allocate your time and resources strategically to obtain the business’s goals and objectives. The saying “do not put all your eggs in the same basket” is important to ensure your business succeeds now and in the future. Before the Global Financial Crisis, we specialised primarily in permanent recruitment and had more positions than people to fill them. However, with the GFC we expanded our horizons to provide temporary, labour hire and contract recruitment services. For the past nine years, this has been our core business. By continually diversifying your business goods and services, or by having a marketing strategy that targets multiple market segments you can create a safety net against changes in your industry and the economy. Lastly, success does not happen on its own—it goes hand in hand with hard work. From the new kid on the block in 2007, being told to “come back when you have more skin in the game” to a recruitment agency that is regularly cited as the best in Brisbane, the business has come a long way in eleven years. “I was told to come back in five years when the recruitment agency had more experience. But I knew that in five years I would be far too busy with too many jobs and clients on the books that they would have to call me instead,” Simone Young said. Simone Young’s determination and persistence got Youngbrook Recruitment off the ground and growing rapidly to the successful business it is today. By applying these eleven pillars of business success that Youngbrook Recruitment have learnt over the past 11 years of success, we hope you can succeed at achieving your business goals.